Obituary for Eleanor "Ellie" DeAngelis | Ajak Funeral Homes, Inc.
Eleanor "Ellie" M. (Kolwicz) DeAngelis, 93, of Brackenridge, took our Lord's hand in unison on Saturday, April 28, 2018, at home, with her family at her side. She was born in Natrona on May 23, 1924, to Michael and Josephine (Nyga) Kolwicz, the second of seven children. 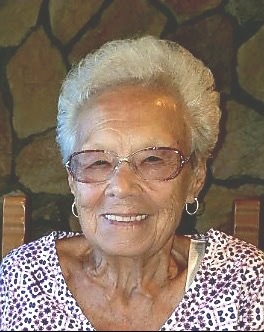 She lived the first part of her life in Natrona and was a longtime resident of Brackenridge. During WWII, Ellie served her country by working at Allegheny Ludlum Steel, Brackenridge, as well as Pittsburgh Plate Glass, Creighton. A year after the war ended, she married Raymond Q. DeAngelis on June 10, 1946, and they moved to Brackenridge where they raised their four children. After her children were grown, Ellie worked as an administrator in the dietary department of Allegheny Valley Hospital, Natrona Heights. Ellie was an avid reader and immersed herself in romance novels. She really enjoyed traveling, especially to Disney World and on Disney cruises, where she was a platinum member of their Castaway Club. She was also an excellent cook and always hosted large family dinners for the holidays. In the summer, you could usually find Ellie sitting beside the pool with her grand-dogs. She also met Hines Ward in the fall of 2017. Hines was her favorite Pittsburgh Steeler. She was of Christian belief with much faith and was a member of St. Ladislaus Roman Catholic Church, St. Joseph Parish in Natrona. She is survived by two sons, Raymond (Bonnie) DeAngelis of Sarver and Martin (Jeane) DeAngelis of Harrison Township, a daughter, Deborah DeAngelis with whom she resided, a grandson, Christopher (Leanne) DeAngelis of Plum, a great-grandson, Dawson DeAngelis, her sister, Barbara Malicki, her sister-in-law, Pat Kolwicz, numerous nieces and nephews and her grand-dog, Carma. In addition to her parents, she was preceded in death by her husband of 42 years, Raymond in 1988, daughter Carlotta Schrup, two brothers, Edward and Michael Kolwicz, and her sisters, Marie Abate, Irene "Renee" Kreminski, and Marcella "Tooky" Jenkins. Family and friends will be received from 2 to 4 and 6 to 9 p.m., Tuesday, May 1, 2018 in the Paul R. Ajak Funeral Home, Inc., 2 Pine Street and River Avenue, Natrona where parting prayers will be at 9:30 a.m., Wednesday, May 2, 2018. A Christian Funeral Mass will be held at 10:00 a.m. Wednesday, May 2, 2018 in St. Ladislaus R.C. Church, 48 Spruce Street, Natrona. Entombment will follow in Mount Airy Mausoleum, Natrona Heights.